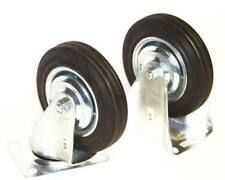 Heavy duty caster wheels. - Lock and unlock easily. Easy to use and install. - Wheel Material: TPR. - Height: 6". 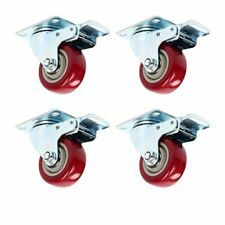 【High Quality Dual Locking】: The 2" Swivel Casters wheels made of premium steel and TPR rubber, very quiet running, absorbs shock and vibrations. Ball bearing and dual locking bring a max loading capacity and safety,and designed to roll smoothly on hardwood or slick style flooring, helping protect the hardwood flooring (laminate, tile, slate) from getting scratched or nicked. Rotate 360 degrees. Smooth & Silent & Sturdy. Ball bearings: plate ball bearings. Hole center to hole center: 1.3" (35mm) x 1.7" (45mm). Plate Size:, 1.9" (49mm) x 2.2" (58mm). Wheel Material: Rubber. Included 4 casters. 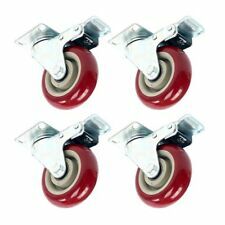 - Color Finish: Red Included 4 casters. - 3" Brake Wheel Tread: 1 1/8" Wheel size:3" Total Break, Side Break Overall Height From Plate to bottom of wheel : 4" Capacity LBS: 300 Lbs. A. 5 x swivel ball caster. B. 10 x swivel ball caster. C. 20 x swivel ball caster. Application: small machinery, trolleys, furniture and rack, etc. USA, Canada, United Kingdom, Austrilia, France, Germany, Spain, Ireland, Italy, Others. Color: Grey Caster with Black End Cap. Designed to protect hardwood floors, laminate, tile, slate, etc. 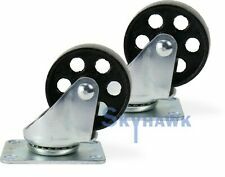 10x Rubber Wheel Casters Note: Chair in the picture is not included. Wheel Material: Rubber, Polyurethane. 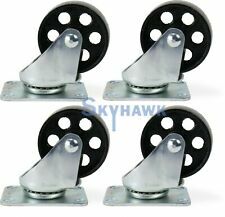 set of 4 Swivel Plate Caster Rubber Wheel 4 Inch (10.1cm) industrial - NEW! These casters can handle a weight capacity of 1600 lbs. Each. This package contains a set of 4 casters. There are 2 rigid, and 2 swivel with brakes. Applications:Industrial Equipment. This package contains a set of 4 casters. There are 2 rigid, and 2 swivel with brakes. Our Medium Heavy Duty Series is the Industry Standard Everyday Workhorse used in most Industrial Caster Applications. Our Medium Heavy Duty Series is the Industry Standard Everyday Workhorse used in most Industrial Caster Applications. Industrial Equipment. Applications:Material Handling Equipment. This gas lift will fit most office chairs available worldwide. Major office furniture manufacturers have been using standard size parts for many years now. This gas lift fits that standard. 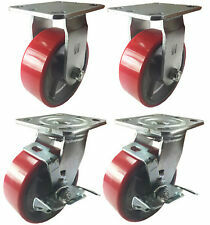 Swivel Casters, Red, 7000 lb capacity, RWM, 6" x 3", Steel Wheel, Qty: 2. 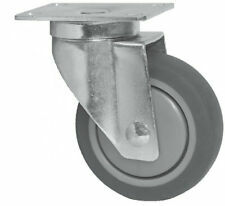 Ball Bearing swivel caster. 330 lbs capacity for each wheel. Tectran WCH07 Wheel-Check Loose Wheel Nut Indicator 15-PK ! NOP ! Nickel Plated Furniture Stem Caster 1 3/8"